We would like to thank our sponsors for their generous financial support and product donations. You, and of course Creator, make it possible for us to provide the "Back To The Garden" Marriage Conference at no cost to our couples. Again, we thank you for making this awesome event a success! Call Hesperia Grossi @ (407) 230-6344 and give her reference# 3258716003 for a great price on a Florida vacation, starting at $99 for 4 days/3 nights. Call Terrence Singleton @ (843) 842-3490 and give him reference# 30952 for a great price on a Hilton Head vacation. 745 East Wade Hampton Blvd. 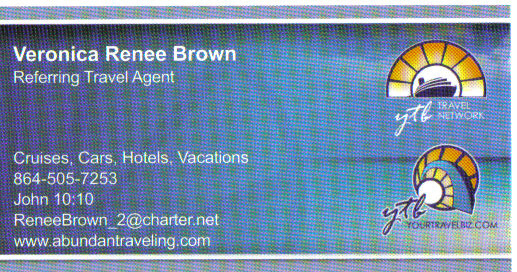 Call Veronica for all your travel needs. Call Jackie & Johnny for all your catering needs.